In my experience it’s hard, when you visit or live in different places, not to compare things like the weather, the food and the people and their ways of doing things with what you’re used to. I remember when I first went to live in Greece, for instance, wondering why strangers didn’t find it rude to stare or ask you how much you earned or whether you were married or not. In Spain I wondered how people stayed up all night long (children included) at some fiesta or other, how the Thais smiled and stayed calm even when they couldn’t possibly be happy and how the French could sit for hours over dinner while intelligently discussing politics or current affairs (and yes, without seemingly putting on any weight). All clichés, in a way, but no less true. So please humour me by allowing me to tell you something that I’m enjoying about the place that I happen to be in right now. At the moment we’re staying with my parents who have a lovely suburban garden with a greenhouse full of tomatoes and … a rhubarb patch! During all those years I was living in Greece, maybe I wasn’t looking hard enough but I didn’t see a single stick of rhubarb. So when I heard my dad ‘grumble’ the other day that the rhubarb was getting too big, my ears pricked up. Well, what a shame. Someone needed to pick some of the rhubarb and make something with it. I wonder who might like to do that. ‘Oh, I’ll make something if you like,’ I said, as nonchalantly as I could. 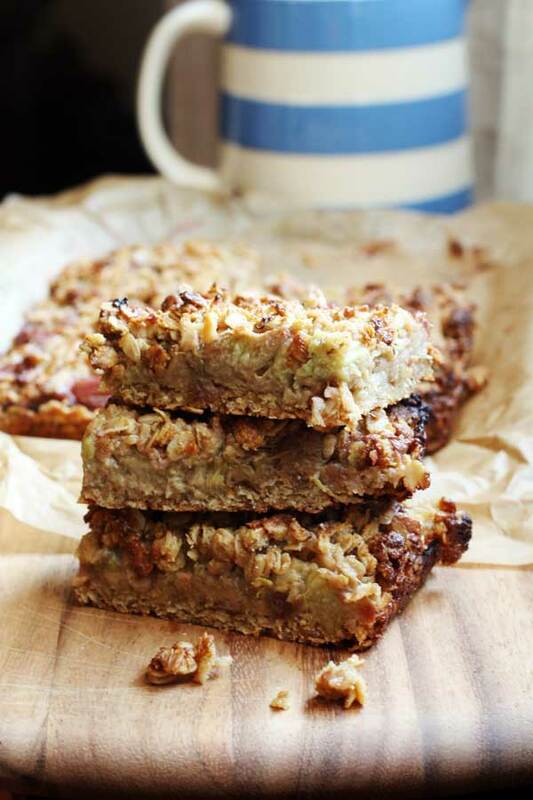 So that’s how these rhubarb & ginger oaty slices came into being. I remember seeing something a little similar made with raspberries, and I loved the ‘rhubarb crumble and custard’ that we Brits know so well when I was a child. 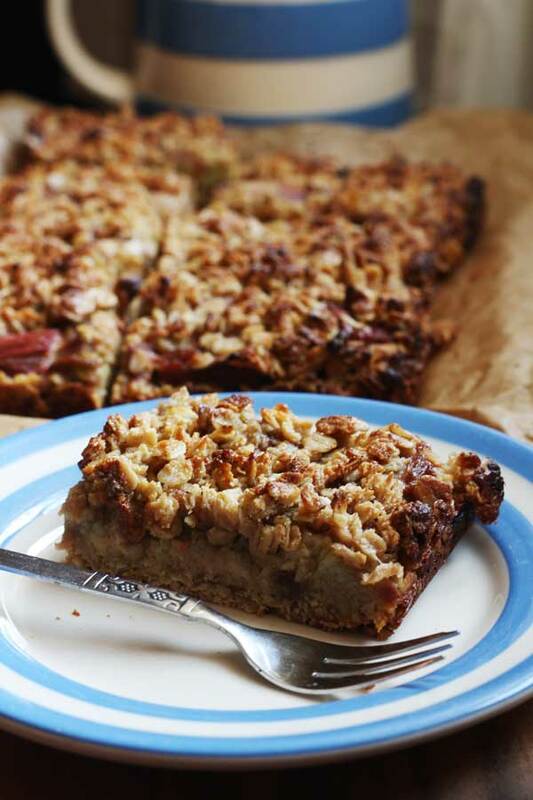 I also loved a sort of chewy, oaty slice that we call ‘flapjack’, so I decided to see if I could come up with something that was a kind of cross between a rhubarb crumble and a rhubarb flapjack. And I think I actually got it about right first time. These oaty slices were insanely easy to make. After picking some rhubarb (yes, I did say after picking it! You can’t imagine how satisfying that was after living in a flat with no garden for years), chopping off the leaves and cutting it into pieces, I took a moment to take in the unique and beautiful scent of the freshly cut fruit (which so reminded me of dipping raw rhubarb sticks into sugar as a child!) then cooked it for about ten minutes with a little brown sugar. To make my oat mixture I melted a little butter and brown sugar and plenty of honey together before adding oats, ground almonds and ground ginger. Finally I assembled everything by pressing two thirds of the oat mixture into the bottom of a baking tray, spreading the cooked-down rhubarb on top, and sprinking the rest of the oat mixture on top of that. Then into the oven it went. The finished result was, as I said, just what I’d been aiming for; as you take a bite there’s the crumbly, oaty top, then the beautiful rhubarb gets your taste buds singing as only rhubarb does. Finally, there’s the slightly chewy flapjack-y layer on the bottom. I shared this dessert with my family, of course, but I’ll let you into a secret. I’ve shown it served with a ball of ice cream in the picture below, but we actually ate our oaty slices with custard, a hot creamy vanilla sauce that may well not be very well known in your country (if you ever get a chance to try it, though, please do, as it’s delicious). Don’t worry, though. For ‘testing’ purposes, my mum and I also sampled the slice I photographed with ice cream, and that was scrumptious, too. Finally, my dad took the last of the slices to work with him two days later and declared that they were just as delicious cold and on their own. So, enjoy these warm or cold with ice cream, cream or custard or just by themselves. Both myself and my family assure you that they are very tasty devoured any of these ways! If you live in a place where you can’t easily find rhubarb, you could go ahead and try these with berries (just don’t cook them first) or really any other fruit. Please let me know how they turn out if you do try that. OK, so here’s the recipe. Enjoy! 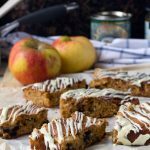 If you've ever tried a fruit crumble or crisp, or enjoyed an oaty flapjack or granola bar, you'll love these oaty bars sandwiched together with fresh rhubarb. Perfect either cold or warm with custard, ice cream or cream. Pre-heat the oven to 410F/210C and line a 7 by 10 inch baking tray (or an 8 by 8 inch square pan with baking paper. Heat the rhubarb and sugar in a large pan with 1 tablespoon water for 10 minutes until cooked down but with some pieces of rhubarb still whole. Set aside. 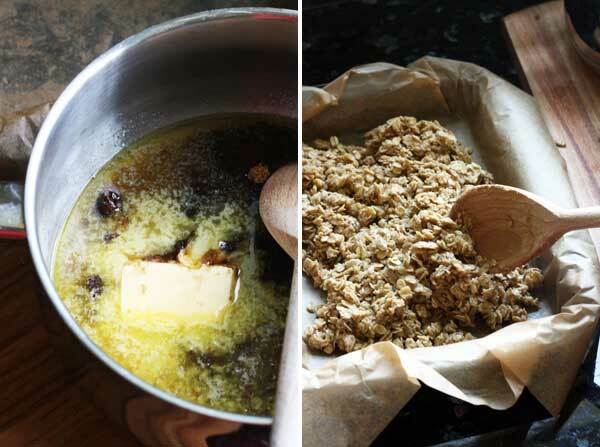 In another pan, melt the butter, sugar and honey, then take off the heat and stir in the oats, ground almonds and ginger until all the oats are well coated. Spoon two thirds of the oaty mixture into the baking tray and press down well with the back of a metal spoon. Spread the rhubarb over the oats, then sprinkle the rest of the oaty mixture over the top. Bake for 20 to 25 minutes or until the oats are golden brown. Leave to cool before cutting into slices or serve while still slightly warm with custard, ice cream or cream. Will keep in an air-tight container in the fridge for a few days. You could use another fruit instead of rhubarb, such as berries or nectarines/peaches, but don’t add sugar or cook the fruit down first. Adding a teaspoon of ground ginger gives a nice subtle taste of ginger. Add a little more ginger for a deeper gingery flavour if you like. *If you only eat gluten free, please check that the oats you use are in fact gluten free. In theory oats should be, but some brands can be contaminated with small amounts of gluten. You could use another fruit instead of rhubarb, such as berries or nectarines/peaches, but don’t add sugar or cook the fruit down first. Adding a teaspoon of ground ginger gives a nice subtle taste of ginger. Add a little more ginger for a deeper gingery flavour if you like. Yes, the greenhouse is full of lovely tomatoes. Wish it was mine! Sorry about your plants … that’s so sad! Yeah, go and find some! It’s beautiful! Wow, beautiful. I might be the only blogger left that is yet to try rhubarb. I am becoming more and more fond of rhubarb and we have a massive patch of it and have recently made tons of chutney. OH is the flap jack maker and I will pass on your recipe to him. 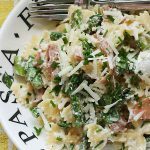 I’m so excited to see this recipe because rhubarb is coming into season here very soon! 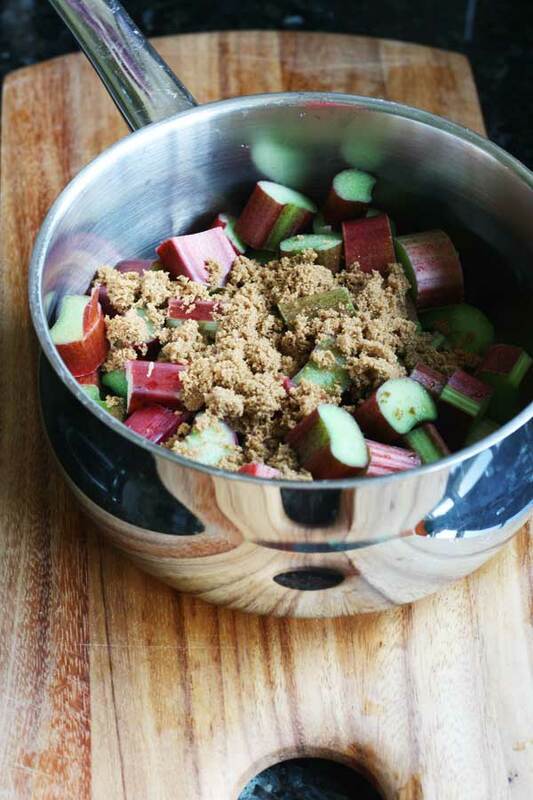 I love picking rhubarb and dipping it into sugar – like you said, maybe even a part of childhood. With the oatmeal, this is kind of like a breakfast option. Looks delicious and kind of nutritious too, just the thing to bring to a family picnic for me =) Father’d Day picnic I think since your dad liked it so much. That’s a lovely idea to make these slices for Father’s day! They are fairly hearty and substantial as a dessert which sort of matches dads, doesn’t it? Haha! Fabulous idea to eat these for breakfast, too. I think that would be perfectly acceptable because of the oats and fruit and relatively low fat and sugar amounts. So glad you like them and hope you can enjoy your rhubarb season soon! So, I love your recipe. I don’t think I’ve ever cooked with rhubarb before, but I must try it soon! I know what you mean about comparing different cultures, etc. It’s so fascinating to see how others live/be happy in conditions and situations that I would be incredibly uncomfortable with. 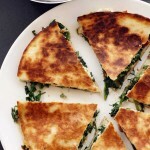 And this recipe just looks incredible! I wish I had the problem of too much rhubarb! And it totally does make your tastebuds sing like nothing else. The ground almonds would be perfection with this! Mmm mmm! Yes, it has such a unique flavour, which I love. So glad you like the slices (and the word ‘oaty’ – OK, I admit it, I did make that one up) and your point about looking to better things on the horizon is lovely … totally agree. 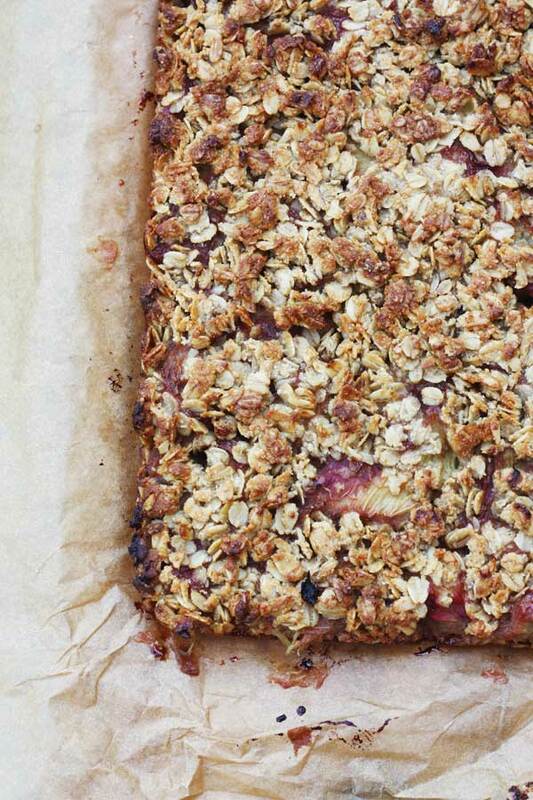 These rhubarb and ginger oaty slices sound delicious. So happy rhubarb is in season! We always want what we don’t have, I guess. I would give anything right now to just get settled … but trying to see the ‘excitement factor’ of the travelling here and there! Oh, YUM! These are like a rhubarb crisp in bar form! LOVE it! That’s exactly what they tasted like, Liz, but with a chewier layer on the bottom. Exactly as I wanted them to be! Glad you like them! They look tasty – especially with ice cream on top! This looks fantastic! I have never ever had rhubarb, I keep seeing it on blogs but I don’t know of anyone that cooks with it. That is one reason why I love blogging and the blogging community, there are so many great ideas out there and this makes it so easy to share them! I totally agree, Annie. 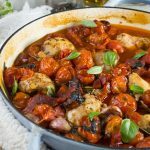 I see ingredients that I’ve never cooked with all the time on blogs – healthy ingredients, especially. If you can get hold of some rhubarb, I’d definitely try it just to see what you think. I don’t think you’ll be disappointed. So glad you like the recipe! That oaty mixture is singing sweet nothings to me because it looks marvelous! What a great treat! Love the sound of these oat bars! I can only sometimes find rhubarb but I’ve seen it at the store the last week or two! It is hard not to compare too much – when we first moved here from DC I found myself doing the same thing. But we love it in NC now : ) It was just such a change from DC! So glad you like the bars and … snap up that rhubarb while you can! Or hunt out a friendly neighbour with a patch in their garden! Funny enough, now, I adopted Canada as my home (or Canada adopted me :)) and I compare it with France when I visit… Could I re-adapt one day? not sure! Can you picture living again in England after so many “homes”? Anyway, I am going into a conversation alone! Again, you do need to move to Canada so we can have coffee chat as I mentioned before! 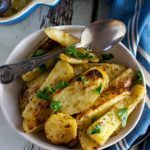 This recipe would work perfectly at any time for me! PS: Thanks for the head-up for my comment problem on my blog! I really appreciate it! Hi, Melanie! You know what? If I ever visit Canada (which I would love to some day – I visited Quebec many years ago but there is still so much of Canada to see) we will have that coffee chat. Or if you ever visit the UK! I’m wondering if I can adapt back to the UK now too after so many years, especially right now as I watch the rain streaming down the windows for the third entire day in a row. (oops – better not complain!) Glad you like the recipe! Sounds like your parents have a wonderful garden/greenhouse. Thinking we might see a tomato recipe soon from you as well……. Love oaty crispy sweets, they are my favorite, bet the ginger gave it a nice flavor. That’s really a nice way to face and handle change Helen, always think about what is good that is happening now. My dad is busy tending the tomatoes every evening after work so I’m sure it’ll be a good crop. I don’t think we’ll be here to enjoy them, though (got to go to Australia again). I wish we were, because tomatoes are very expensive in Australia believe it or not (there I go comparing again!). Hope you are enjoying Oregon, Cheri! This recipe sounds so delicious and easy too (which is always a bonus when it comes to baking)! I especially love the combination of ginger and rhubarb. Also, just a tiny bit jealous of all the wonderful places you’ve lived! A lot of people say that, Louisa. I don’t think I’ll ever get tired of travelling, but I am ready to settle somewhere now! I was pleasantly surprised by how well the ginger went with the rhubarb. So glad you like these slices! I cannot WAIT to try rhubarb. These bars sound amazing! It is so neat hearing about all your different travels. You get to see and try and watch so many things I never would’ve thought of! Keep up the fantastic blogging, even though you have so much going on! Thanks so much, Mary Frances … hope you are having a great time on vacation! We’re getting through our list of things to do, but have got to go back to Australia again soon. Can’t believe it! 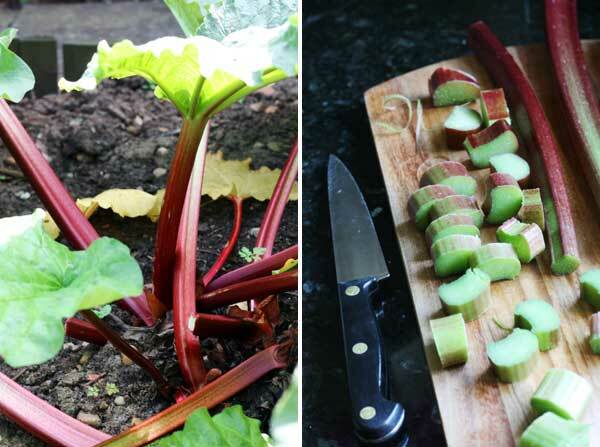 Please DO try some rhubarb … you’ll love it! A rhubarb patch…what a fantastic surprise! The first time I ate rhubarb I didn’t know what to expect, but ended up being completely blown away. Delicious! 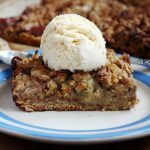 My boyfriend is crazy for rhubarb so I bet he would love this recipe. I bet I would, too! Yes, it has such a unique flavour, doesn’t it? I pretty much pounced on that rhubarb patch after I saw it! So glad you like these, Alyssa! What bliss Helen! Freshly cut rhubarb no less. And you know I was similar when I left Australia to live in Japan. It was only after being away that I appreciated how great Australia is to live in. Wow, I would love to be out there picking rhubarb too. I hope to get to try rhubarb sometime. These bars just might be my first try at rhubarb. I like the combination of ginger and rhubarb, it sounds so good. I definitely need to get me some rhubarb. My neighbor was just telling me that the local farmers market has it now. I need to get myself over there quickly. I’ve been seeing great recipes for rhubarb. 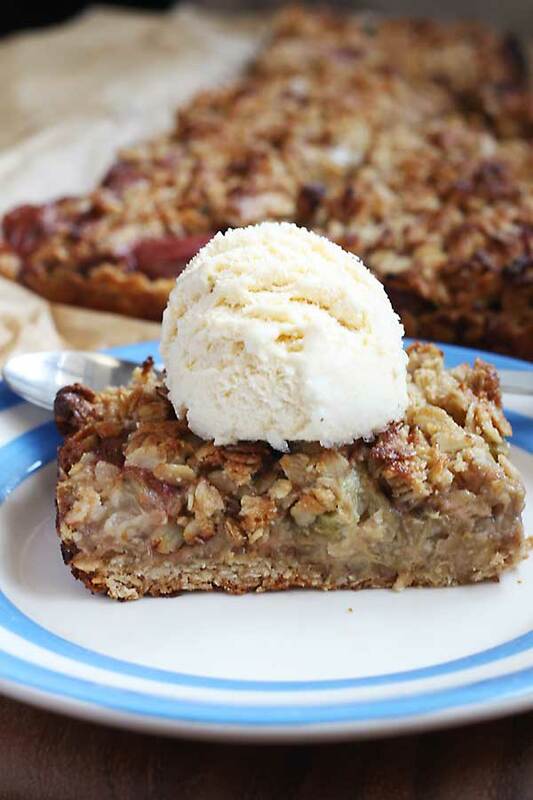 Yay for looking on the bright side…and for rhubarb! I’m a bit of a rhubarb addict lately. These bars look awesome! This is such a great idea! yummy and gluten free. Thanks, Layla. So happy you like them! OMG !!!! I am drooooooling !!!! These slices look incrediblyyyy tasty!!!!!! I have never eaten rhubarb before! We don’t get it here! 🙁 But like you said, I’m going to make these with berries! So So perfect! I’m so jealous that you get to pick rhubarb, Helen! Rhubarb is one of my favorite pies, yet I only seem to eat it every so often. And these slices look delicious! Now I have another recipe that I can use rhubarb for. Pinned! Well, I think being able to pick anything at all from a garden or window box or whatever is amazing. I must try to make something else with that rhubarb before I leave my parents’ house. So glad you like this recipe, Gayle, and thanks so much for the pin! Haha … yes, I have to be careful that I don’t moan too much about the weather now that I’m here in England. It’s very tempting but I’m trying to follow my own advice and be positive! 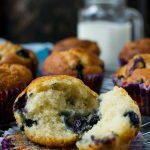 I’m visiting your site for the first time and you baked with one of my favorite ingredients! I love rhubarb, and have been baking a lot with it lately. I’ve only combined it with berries this far, and that needs to change — these look incredible! You’re so lucky you’ve gotten to love in so many different countries — I’ve been to Greece and England and would love to have stayed much longer! I must have done that just for you, Marcie! I loved your post on the beautiful Mary Frances’ site (isn’t she sweet?) and am looking forward to hopping over to check out your site, too. Thanks so much for dropping by to say hi and so glad you like the rhubarb slices – I was really pleased with how they turned out. I love that you have been to same many countries Helen. I’m moved to different states within the US and too have found many differences. Most notably, when I lived in Eastern Florida everyone would ask my religion. They were obsessed with religion, particularly Baptist. That was hard to deal with because if you said anything other than Baptist they would want to talk your ear off about converting. Anyhow, I love that you picked your own rhubarb for this treat. It looks delicious! lol … that’s funny about the Florida baptists, Cindy! That must have got old pretty fast! I find it really fascinating that you have so many differences between states over there in the US. I’d love to do a big road trip one day to experience some of them for myself. So glad you like the rhubarb slices! These look fab! I’ve been given a jar of preserved ginger and wondered if I could use that instead of ground ginger. If so, I wonder how much? Hello, Maz! Ooh, now there’s a question! You can definitely use the preserved ginger instead of ground. Why not? It’s just for a hint of a gingery taste, after all, so if I were you I’d chop up finely and add one or two balls of the preserved ginger and see how you go with that. Let me know how you go! I just made this, so yum! I cooked the rhubarb with some stem ginger and the syrup from the jar instead of sugar, which worked really well. I also replaced the butter with coconut oil which made a nice change. Thanks for the recipe! Hello, Jess. 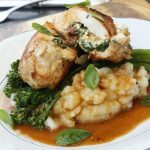 So happy to hear that you tried this and enjoyed it, and even made some successful substitutions! I must make this again soon – it’s my dad’s favourite! Hi this recipe sounds divine and I am about to go pick some rhubarb from my garden and make it right now! I just wanted to point out however that this isnt a gluten free recipe as oats are what need to be avoided in a gluten free diet, especially with the coeliac disease. 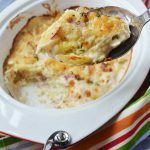 Love your blog, which I have just discovered, and this recipe was exactly what I was looking for, It’s cooling right now. RAIN IS LOVELY! There would be no lovely rhubarb without it! The smell of the earth, the cool air and it makes everything so green! It took me ages to readjust after living in Morocco. Last year I went to Greece for the first time and now I will always long for that azure sea! Hello Rosemary. What a lovely message to wake up to today! I always appreciate feedback, so thank you so much for taking the time to comment. This is an older recipe with not-so-perfect photos, but I’m so glad it turned out well. 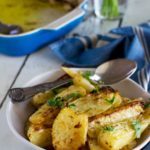 This is still one of my dad’s favourite recipes! I’m so happy you’re enjoying the blog. Wow, Morocco! I once visited Tetouan for just 1 day from Spain which was an incredible (if not a little nerve-wracking) experience. The food there must be amazing! By “ground almonds” do you mean coarse ground or almond flour? Hi Melissa! In the UK (where I was when I posted this recipe!) 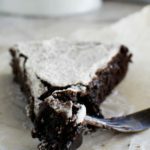 almond flour and ground almonds are interchangeable – so either is fine! Hope you enjoy the recipe! Hi Raelene! Aw, sorry to hear this! Did you serve it warm or cold? 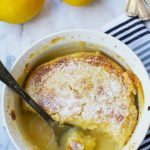 If it’s warm it probably will be a bit crumbly – that’s OK because it ends up more like a crumble pudding that’s great served with ice cream or custard or cream. If it’s cold (still very delicious!) you’ll find the pieces will stay together better. It really doesn’t matter if it’s a bit crumbly though. I hope you still enjoyed it!